The Best Beaches in Nusa Dua Bali is one of the most attractive regions found on the Island of the Gods. This area is known for the luxury, serenity and sunny weather. The tourists can find many 5-star resorts and hotels. This is quite natural because from this part of this Island you can get access to numerous sandy beaches. Many people use Nusa Dua as some sort of a base that they can use to explore the archaeological, historical, cultural and natural attractions found on the island. Technically, this area covers the whole eastern side of the famous Bukit peninsula which is situated in the southern part of Bali. As we already said, there are some magnificent Bali Beaches in this region even though people can find many other interesting things to see and do there. Located just 40 kilometers south of the capital city of Bali – Denpasar. This place is a must-see for every tourist. Keep in mind that the airport is situated less than 30 minutes from this area. When it comes to activities, many visitors have recommended practicing water sports like parasailing, fly fishing, diving, jet skiing, and surfing. Keep in mind that this part of Bali is close to the famous Serangan Island which is also known as Turtle Island. This turtle conservation area can be explored with the help of boats with glass bottoms. In addition to turtles, visitors can also see birds, reptiles, bats, and snakes. If you are more interested in culture and art. You can check the Pasifika Museum where you can find artwork from European and Asian artists. This is also the place where you can find many Polynesian artifacts. Now that you’ve learned more about this area. It’s time to present The Best Beaches in Nusa Dua Bali. 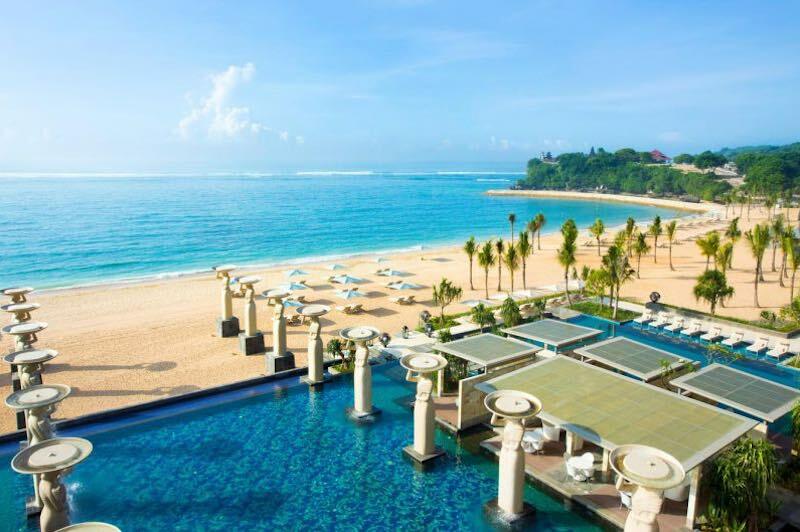 Nusa Dua is known as a place where you can find many 5-star resorts that provide access to private beaches. However, there is a public seashore in this area which is not operated by any resort or commercial organization. This seashore is known as Geger Beach Nusa Dua Bali. It is a place where you can feel the spirit of this region. One of the first things that visitors will notice about it is the amazing white sand. Due to the fact that it’s located to the east. You can expect slightly colder winds or summer breezes which will make your stay there quite comfortable. Even when the weather is hot. Another great thing about Geger is that you will enjoy really warm water. The presence of the attractive reef close to the area is one of the main reasons why this part of Bali has very warm water. As the same time, the presence of the reef makes Geger an excellent spot for surfers. Of course, visitors can also enjoy swimming if they want to. No matter what you decide to do. You can rest assured that you will find a beautiful spot to drink a cocktail or get a relaxing massage. Geger Beach Nusa Dua Bali is a place where you will find a few beautiful restaurants that are offering local and international food. Warungs with lovely beach beds and few other things that will make your stay very pleasant. In case you want to travel to this area, you should know that public transport is not organized well in this region. However, the majority of hotels and resorts will be glad to help you by finding taxis. All in all, Geger is a place that every visitor should check. Sawangan Beach Nusa Dua Bali is another popular beach. One of the Best Beaches in Nusa Dua Bali. This area is located south of Geger and it’s quite smaller compared to it. Yet, you can rest assured that it won’t get crowded at least most of the days. 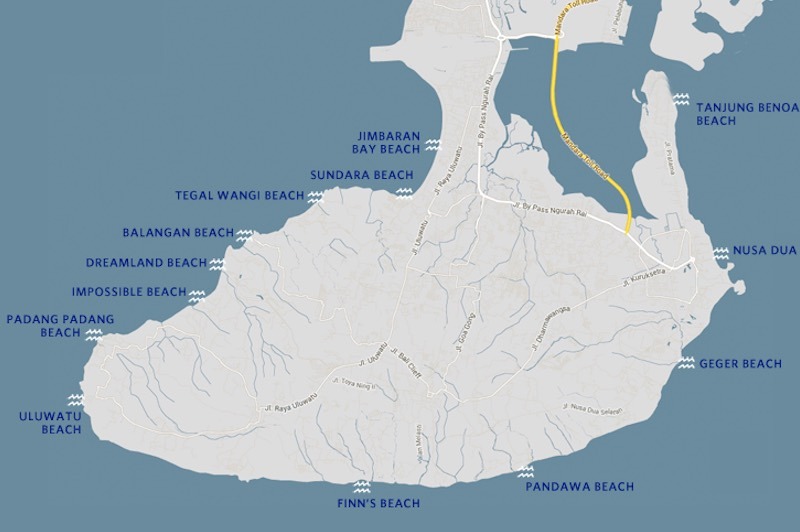 What’s interesting is that there are a few exclusive hotels located close to Sawangan. Like Hilton Bali Resort, The Ritz-Carlton and The Apurva Kempinski. Sawangan village is full of places of worship and few of them are located close to the seashore like the Pura Batu Belig. You will find white sand on this area and crystal-clear waters. Due to the fact that it belongs to the same area covered as Geger, you can expect warm water and frequent waves which make the area ideal for surfing. Both experienced and beginner surfers are enjoying the waves on Sawangan. If you are into swimming, you will find this spot equally attractive. The same goes for people who want to try some other water sports. 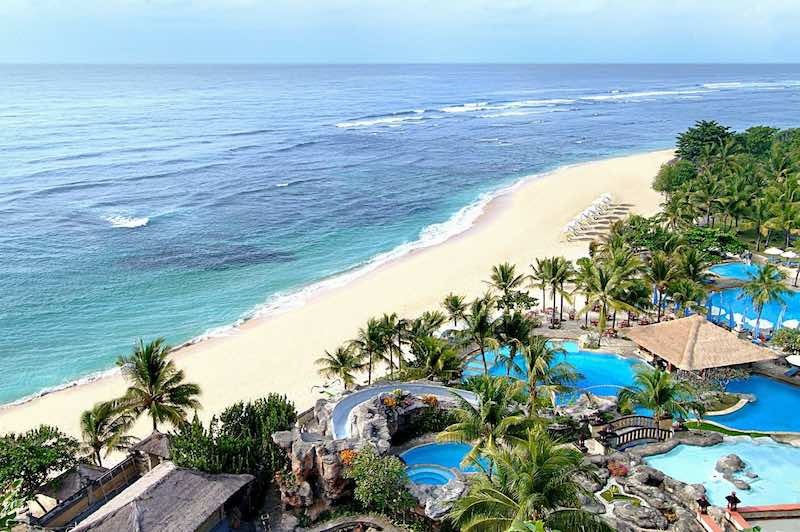 In the recent years, Sawangan Beach Nusa Dua Bali is getting more and more popular. This is the reason why there are a few restaurants located here. You can use sunbeds and drink tasty cocktails while you are there. Some of the places where you can find great national and international food here include The Shore Restaurant & Bar, Paon Bali Resto & Bar, and Serenity. Sawangan is usually visited by people who are looking for tranquility and relaxation. You should not expect crowds even when the season starts. This seashore is usually very clean and you can enjoy the amazing views of the sea from here. It’s quite easy to access to this area because there are a few small roads that lead to it. Truth be told, Padang Padang Beach Nusa Dua Bali is located close to Uluwatu. This is a trip that is definitely worth taking. Padang Padang is an amazing area. It’s not difficult to spot this area because it’s located close to the famous Uluwatu sea temple. This is one of the best beaches in Bali. What makes Padang Padang extraordinary is the setting. Namely, this seashore is located in a place surrounded by huge rocks. As a result of that, there are a few interesting caves around it and those of you who love adventures should definitely explore them. If you want to do that, don’t forget that you must wait for the high tide. Padang Padang is an excellent location for swimming. Yet, swimmers should be aware of the presence of sharp corals and sea urchins. This also means that you can use this seashore for exploring underwater life in this region. Of course, some people use it to get involved in various water sports activities like surfing. According to some surfers. This is a nice area for pro because the waves are very big. For those who want to eat and drink. There is a nice warung where you can try local food at a more than reasonable price. This sandy tropical area can get a little bit crowded during popular seasons and that’s why you should do some research before going there especially if you don’t like crowds. Get prepared to walk for a while to get there too. If you don’t mind walking, you can visit a few other interesting places located close to Padang Padang Beach Nusa Dua Bali. Uluwatu The Best Beaches in Nusa Dua Bali is one of the most visited spots on the Island of the Gods. This area is known for a few things, but what most people come for when they are headed to Uluwatu is surfing. In case you like surfing, then visiting this seashore is a must. Most of the places where you can surf are perfect for people who have some experience in this sport. But, even if you are not a great fan of surfing, you can still enjoy this place because there are beautiful spots where you can watch breathtaking sunsets. 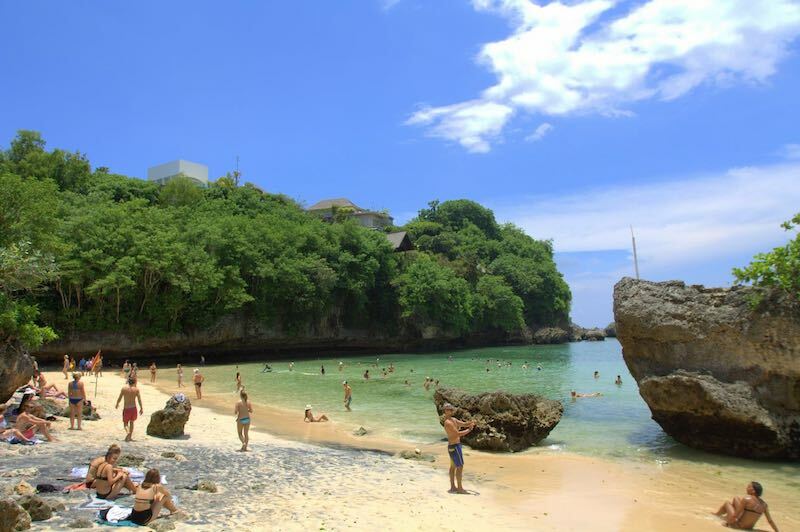 Similar to a few other beaches in Bali, this one is accessible only by a long staircase placed on a huge rock. So, it may be a good idea to take a pair of sneakers when going down because wearing flip-flops can make things more complicated. Keep in mind that this is a short journey worth your time and energy. Uluwatu Bali Paradise has clean, golden sand and it doesn’t cover a large area. From this area, you can view and visit the famous Uluwatu temple. This is the reason why most visitors are taking cameras when they are coming here. In case you want to swim, our recommendation is don't swimming, because the waves can be quite powerful. Luckily, there are a few great swimming options close to this area. The good news is that this place has showers and you can easily get access to a few cafes and restaurants. Potential visitors can also find a few excellent accommodation options that are just a few miles away from this place and they are offering accommodation at a reasonable price. For many years, Dreamland Bali was a hidden gem of the Bukit Peninsula, but after the development of a few exclusive resorts. This magnificent area has become accessible to all tourists who appreciate pristine sandy beaches and blue seas. Even though we are talking about a well-developed area. It’s great that Dreamland seashore is not a fully commercialized and crowded place. Every beach enthusiast, explorer or surfer will find this area attractive. Don’t forget that surfers can find some really nice breaks close to the coastline. In addition, there are a few amazing surf spots close to Dreamland too and that’s why this place is part of many daily surf tours in Bali. Since we are talking about a developed area. You should be prepared to pay for parasols and deck chairs. While you are there you can also get a massage that will help you unwind and relax. Another thing that is worth mentioning is that this place no longer has warungs where you can buy local food. But there are a few small stores where you can find souvenirs, drinks, and other useful things. The local resorts have restaurants where you can eat too. There are a few parts of this area where people can swim. The primary use of this beach is for surfing. 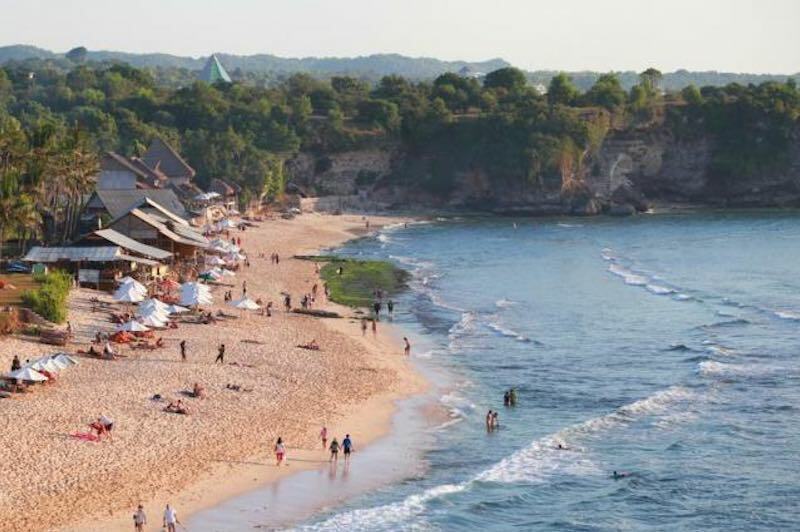 As with many other beaches in Bali, this one can get a little bit crowded during local holidays and the summer period. All in all, Dreamland is a place that is worth visiting because it is offering more than just clean sand and blue sea. Dreamland Bali has a specific atmosphere that can’t be described with words. The list of great The Best Beaches in Nusa Dua Bali ends with Balangan Seashore. This beautiful area is situated around 60 minutes from Dempasar. This is one of the so-called hidden spots of Bali although more and more people are discovering the beauty of this place every year. This sandy area is situated under a magnificent cliff which means that it’s practically invisible when you look at it from the ground. You have to reach the top of the cliff to see it. If you do that, you’ll spot the endless waves of the ocean which create perfect lines for surfing. You will probably see the palm trees too. If you are planning on visiting Balangan Bali, you have to use hundreds of stairs carved in stones. The light brown sandy beach will provide the peace that we are all looking for. Typically, this area is not very crowded. There are two types of people who go there – curious tourists and surfers. The large waves found here are ideal for passionate surfers. The specific nature of these waves makes this place suitable only for experienced surfers. Despite the fact that you will have to walk a little bit in order to reach this area, it’s not difficult to get there. Just reach the Garudu Wishnu Kencana monument and follow the signs. It’s probably a good idea to rent a car or bike or use a taxi to get here because you won’t find many public transportation options to get here. The same goes for the accommodation options which are rare in this area. Without any doubt, this place is worth visiting at least once when you are visiting The Best Beaches in Nusa Dua Bali.